The long-expected shift toward drastically warmer conditions (noted in the previous blog post) will finally come to fruition this week. A lobe of the very strong upper-level ridge that has brought record heat to areas from Denver to Boston in recent days will retrograde slightly on Thursday and Friday. This regional enhancement of the ridge will lead to a pretty unusual atmospheric set-up across SoCal, with deep southeasterly flow aloft but easterly to even northerly winds closer to the surface. This pattern will result in locally quite strong offshore flow, which will combine with the already very hot airmass aloft to produce strong compressional heating in downslope flow regions–which will encompass most of the major metro areas. 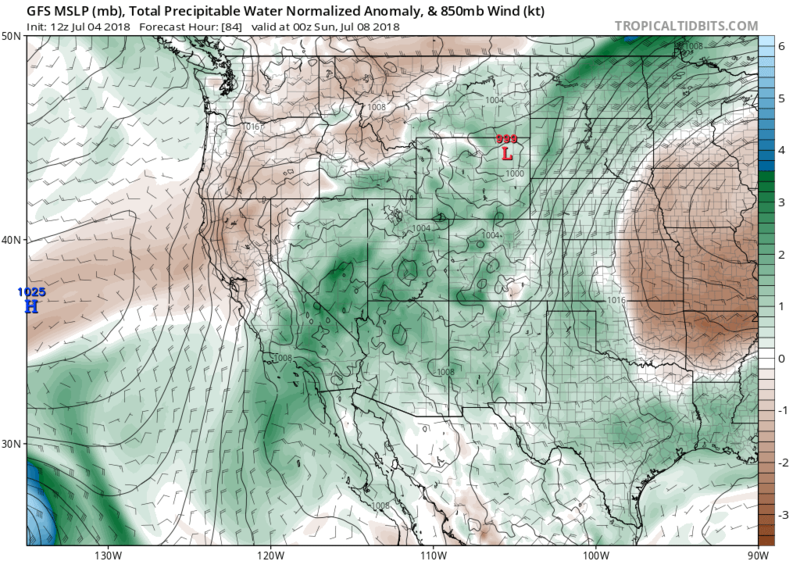 Meanwhile, the deeper southeasterly flow aloft will advect subtropical moisture from the east–resulting in increasingly humid conditions beginning on Saturday. This will likely be a high-impact and memorable heat event, despite the fact that it will be largely localized to the SoCal coastal strip. 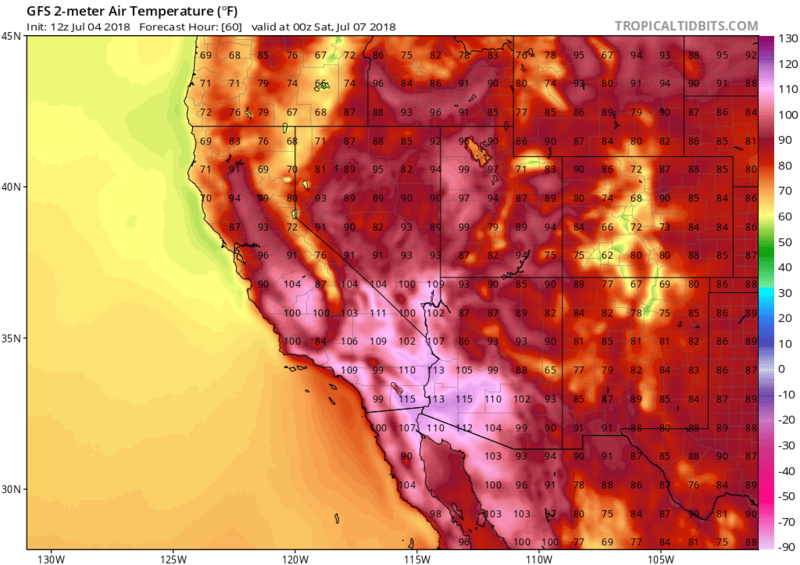 NorCal will not be especially hot this weekend, and even the inland desert regions in SoCal will be hot, but not memorably so. But in Los Angeles and Santa Barbara counties, especially, the heat from Fri-Sun will be extreme due to the localized effects of the downsloping winds and associated compressional warming. Temperatures over 100 will be possible even close to the beach, and just 5-10 miles inland temperatures could approach 110. Meanwhile, Santa Barbara County will likely experience strong “Sundowner” winds, and the rest of SoCal will see some rare mid-summer offshore winds. Surface humidity could be quite low on Friday as the event begins, but will rise to potentially uncomfortable levels by later in the weekend. The National Weather Service expects widespread high temperature records to be set along the SoCal coastal plain this weekend, and an Excessive Heat Watch is in effect to account for this. The extreme heat and localized strong offshore winds along the SoCal coastal plain will clearly lead to major fire weather concerns Fri-Sat. This will be of particular concern given the high degree of ongoing large fire activity in NorCal and subsequent drawdown of firefighting resources, likely fueled in part by our dry winter and the legacy of long-term drought. I would expect to see a fair number of new fire starts between Fri and Sun across the southern portion of the state. In addition to the heat/wind in the south, there may actually be a modest risk of some thunderstorm activity across a broader swath of the state. 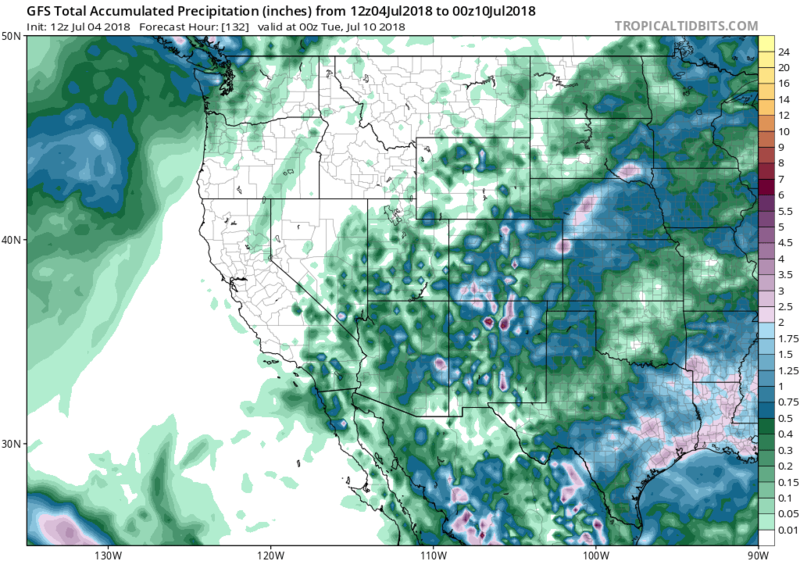 Thurs-Fri, an area of mid-level moisture and weak instability resulting from the decay of former Hurricane Fabio over the Eastern Pacific will become entrained in southwesterly flow to the west of California. While widespread precipitation is not expected, this is the sort of pattern that does occasionally (maybe 20-30% of the time) lead to elevated convection and possible lightning across central/northern California. While the odds are low, this is something to keep an eye on over the next day or so. Meanwhile, across the southern third of the state, a pretty strong early monsoonal surge of subtropical moisture will propagate westward beginning on Friday. A weak easterly wave will arrive on Saturday, probably resulting in mid-upper level cloudiness and potentially (maybe a 20-30% chance) leading to some convection/lightning across portions of SoCal, perhaps even coastal areas, as far north as LA County. This will be a mixed blessing–clouds may prevent the already extreme temperatures on Saturday from rising even further, but the increased humidity will raise the apparent temperature and any lightning could lead to fire starts. 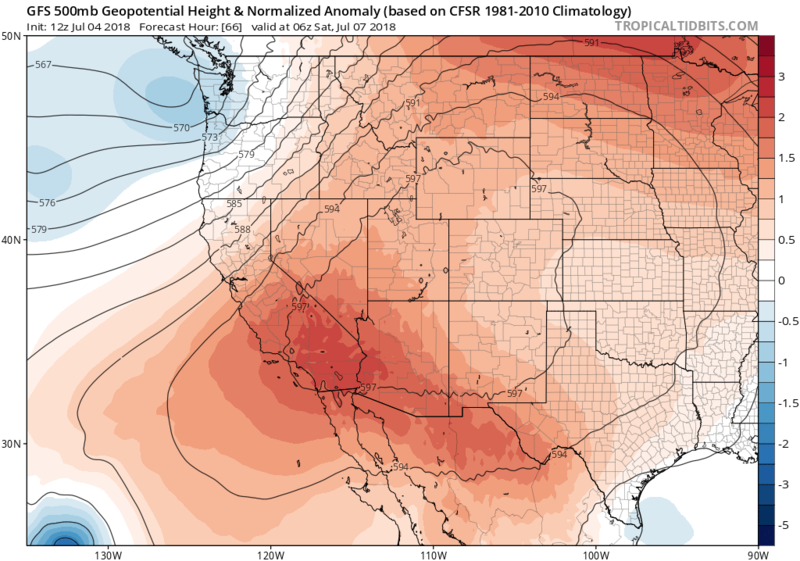 NorCal will escape the worst of the heat over the next 5 days or so. 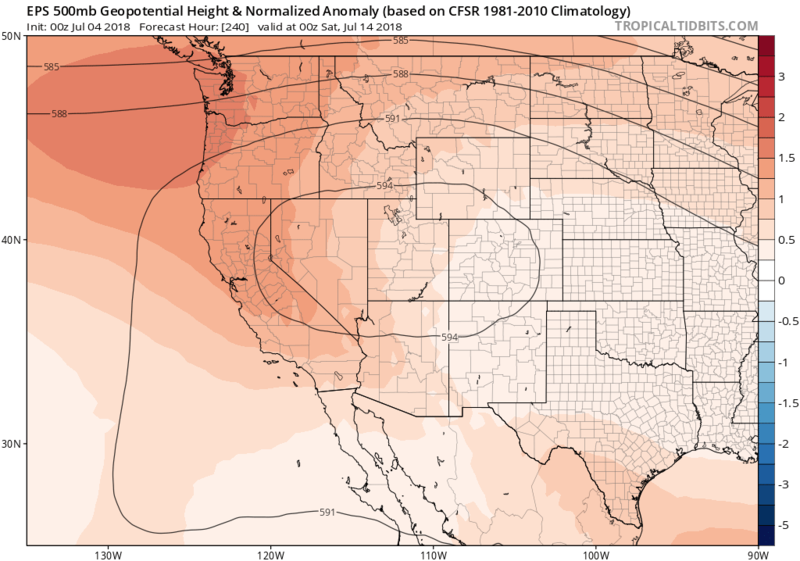 But there is multi-model agreement that the northwestern flank of the SW ridge will expand/strengthen about a week from now, expanding the region of hot temperatures to also encompass most of NorCal. In the meantime, SoCal will experience modest cooling but will remain well above average in the temperature department for the foreseeable future. In addition, models suggest that SoCal will probably experience a pretty prolonged period of higher surface humidity and perhaps uncomfortable mugginess. Along with the humidity, there will likely be multiple bouts of mid-level cloudiness and modest thunderstorm chances (even in coastal areas) over the next 10 days, mainly in SoCal as easterly/southeasterly flow persists. All in all, it appears that a more active summer pattern will be the rule for the foreseeable future, and June Gloom will shortly be in the rear view mirror. « An unremarkable solstice in California; but a hot second half of summer (and what about El Niño)?